What are you reading in September? You can count me among the throngs of bewildered viewers who’ve fallen further than ever into the deep, confusing, and ultimately unknowable lore of Twin Peaks thanks to The Return. 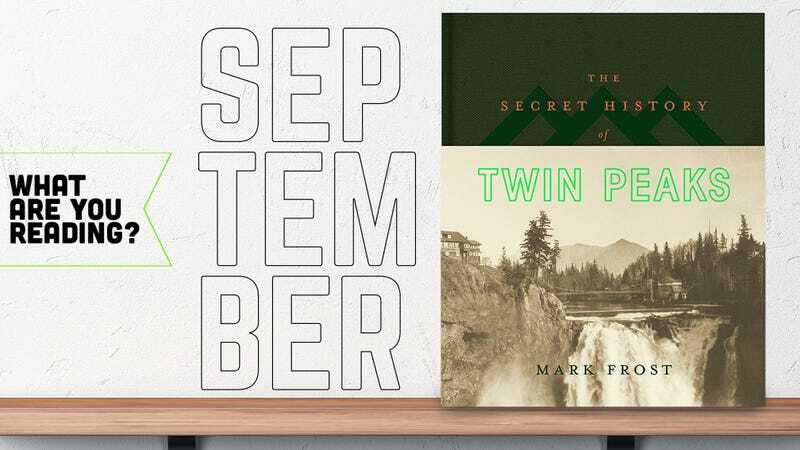 As part of my preparation for the big finale, I checked out Mark Frost’s The Secret History Of Twin Peaks from my local library, and I’ve been poring over it like mad. It takes the form of a document-filled dossier that’s been assembled by a mysterious archivist and reviewed by an FBI agent who shows up in The Return. As the title implies, it’s an all-encompassing look at the history of Twin Peaks and the paranormal phenomena that have haunted those lands for centuries. I recently devoured Jac Jemc’s The Grip Of It in a little under two days. I’ve never read much horror fiction, but I can’t imagine it gets much better than this. Jemc crafts a singularly spooky haunted house tale that, on the surface, is rote horror: A young couple dealing with some marital issues moves away from the city and into a strangely affordable home. The house has a past, of course, and not only does it haunt the couple, but it slowly turns them against each other, too, until neither can be quite sure of the other. The earlier relationship strife becomes key to their burgeoning mistrust. I was legitimately scared during certain passages, as though I were watching a horror movie by myself with the lights out. This isn’t news to anyone who’s enjoyed a legitimately scary book but—it’s nuts! The act of reading something scary versus watching it unfold in a film makes for a much deeper sense of horror. Whereas I can look away from the screen during a scary scene and locate myself in the theater or room—thereby pulling myself out of the fiction to make the scariness less scary—reading a book as propulsive as The Grip Of It rendered me unable to look away, as it were. I have minor quibbles with some of the book, namely that the characters are underdrawn and at times clichéd, especially Julie, who falls into the type-A analytic stereotype of lots of women in pop culture. But since when does a good horror story need to include a character study? Leaving the main characters as mostly blank slates doesn’t lesson their—and the reader’s—scares. I started a Studs Terkel kick a couple of months ago after flipping through a copy of Division Street: America at the Chicago History Museum. (Add a Cubs jersey and some deep dish, and that sentence would’ve been the most Chicago thing ever.) For the uninitiated, Terkel was a Chicago journalist and broadcaster, best known for his oral histories. These aren’t oral histories as we’ve come to know them—i.e., interviews with the people at the center of some phenomenon—but open-ended talks with everyday people about their experiences, collected under a theme: World War II (“The Good War”), the Great Depression (Hard Times), race (Race), work (Working), etc. Following Division Street, I picked up Working: People Talk About What They Do All Day And How They Feel About It from 1974. Although The Good War won a Pulitzer, Working is the Terkel book I’ve heard about the most, and with good reason: It’s a 640-page dive into the work lives of people from around the country, across the professional spectrum. This one will take me all of September and October to read, but the chapters about a migrant worker and miners have once again reminded me of how very, very easy I have it.